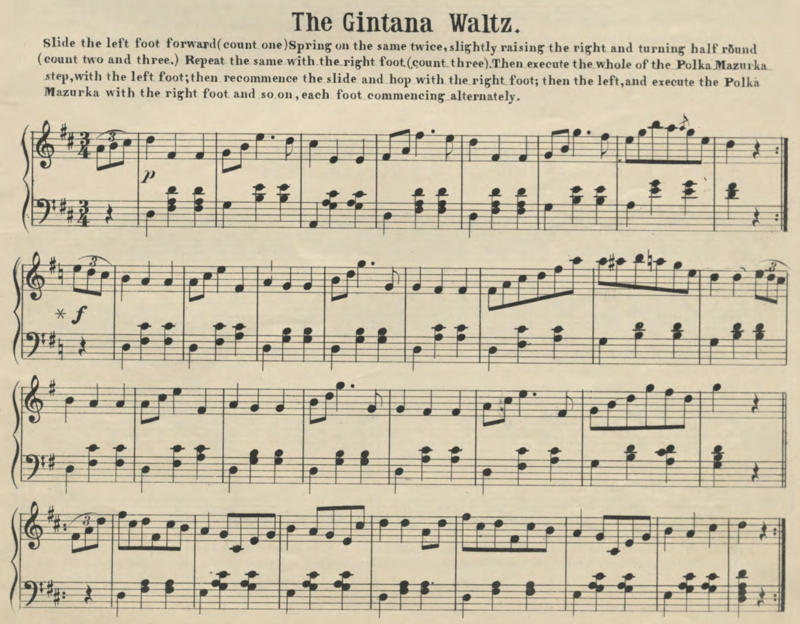 This is a tricky but fun Mazurka variation that combines a turning Pas Glissé with a Polka Mazurka. 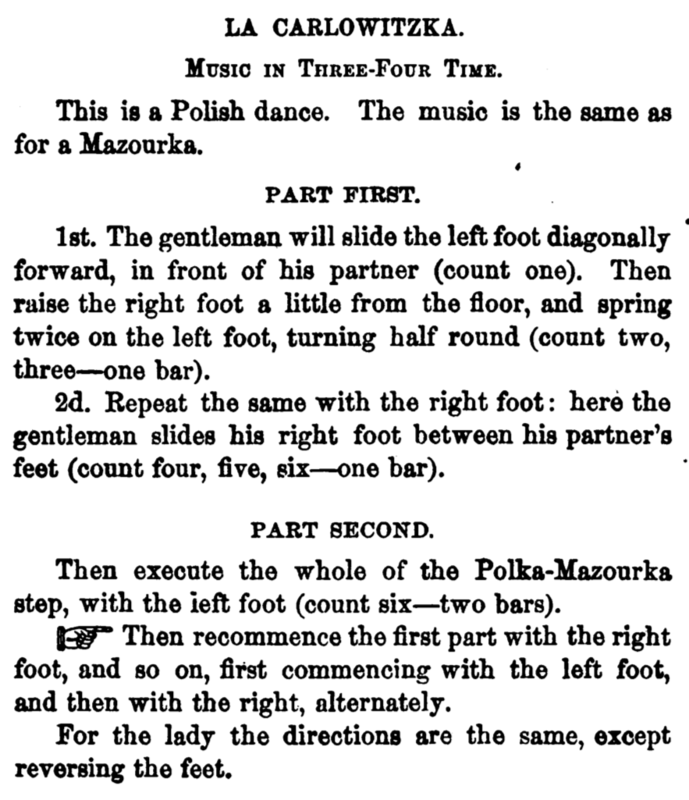 It was likely introduced around 1859, as the first known description was in Ferrero's 1859 The Art of Dancing, Historically Illustrated [EF59], where it was called "The Gitana Waltz." 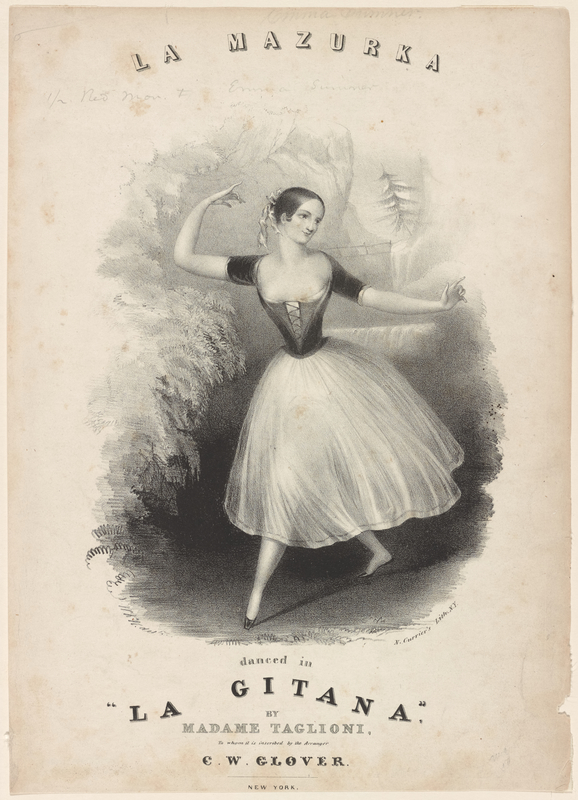 This name likely refers to the ballet La Gitana (1839), in which Madame Taglioni danced a Mazurka (see illustration above). 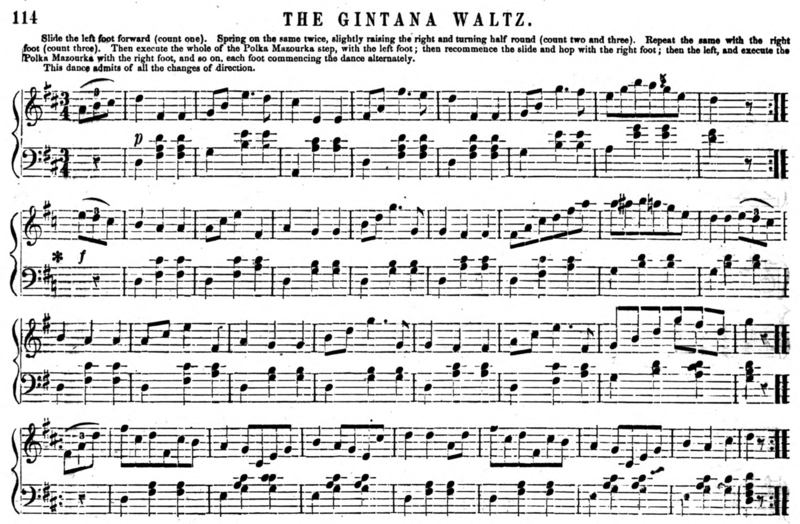 Elias Howe calls it "The Gintana Waltz," which, given that Howe's description is a copy of Ferrero's earlier one, is likely just a typo [EH62]. 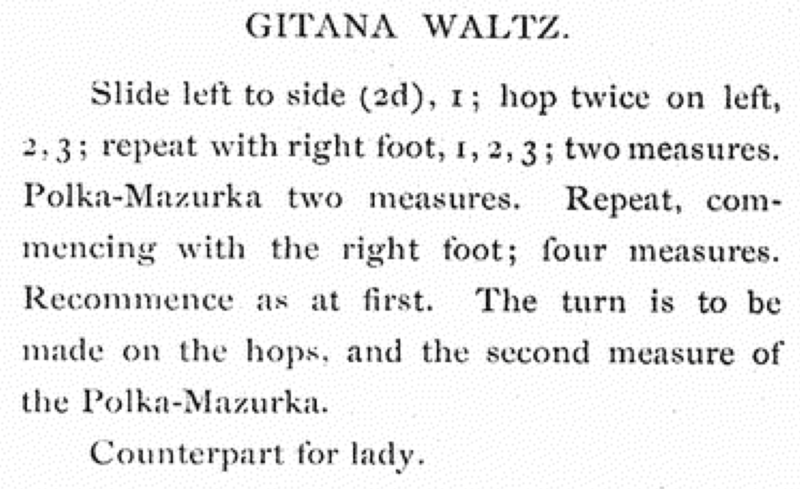 A combination of rotating hops (Pas Glissé) with the Polka Mazurka. 1: The Lead slides his left foot along LOD while the Follow slides her right foot along LOD. Several sources specify that the trailing foot (his right, her left) is raised a little from the floor [TH63, CB66]. 3: The Lead hops on his left foot while the Follow hops on her right. Over the course of the preceding three counts, the couple turns 180° clockwise. 4-5-6: The Lead does exactly what the Follow did, and vice-versa, turning another 180° clockwise, so that the leading hands are pointed along LOD again. 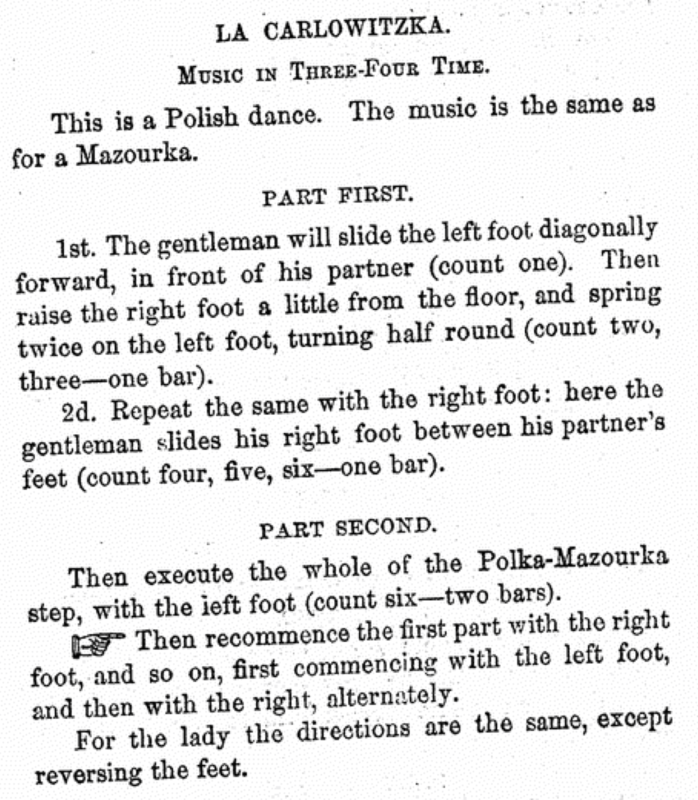 7-8-9-10-11-12: Polka Mazurka, turning 180° clockwise at the end of 6 counts, for a total of 540° in 12 counts. Repeat it all with the opposite foot. Verbalized as "slide-hop-hop, slide-hop-hop, slide-cut-lift, slide-cut-leap." 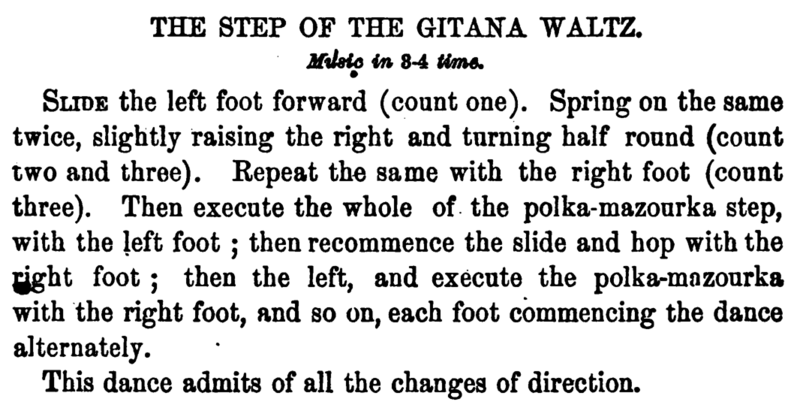 Several sources note that "this dance admits of all the changes of direction," which means it can also be reversed, turning to the left (or alternating right and left turns) [e.g., EF59, EH62]. Elias Howe [EH68, EH80] provides music specifically for the dance. TH63 — Thomas Hillgrove. (1863). A Complete and Practical Guide to the Art of Dancing. New York. CB66 — Charles Brooks. (1866). The Ball-Room Monitor. Philadelphia. EH66 — Elias Howe. (1866). American Dancing Master, and Ball-Room Prompter. Boston. TH68 — Thomas Hillgrove. (1868). A Complete and Practical Guide to the Art of Dancing. New York. EH68 — Elias Howe. (1868). The Pianist's Matinee. Boston. EH80 — Elias Howe. (c. 1880). Fifty Contra Dances, Hornpipes, Reels, Jigs, &c. Boston.